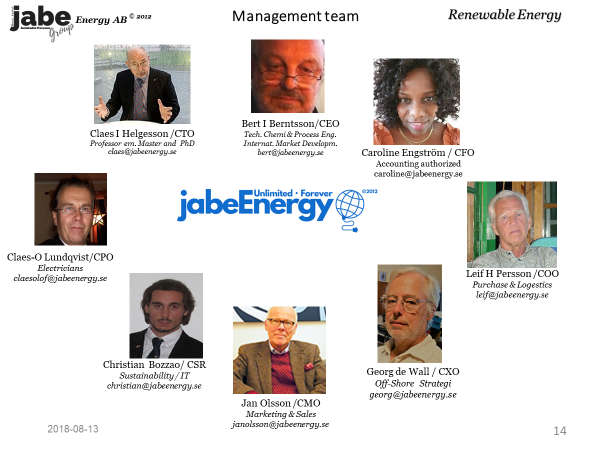 jabeENERGY AB is a Swedish development company in the jabeGRP who hereby present a Run on River energy technology based on a hydro kinetic power. This (RoR) technic takes its power from plane running water. A vertical turbine totally mobile, located on a boat or a raft, need no fixed construction like dams and does not interfere with transportation routes nor prevent fish migration. Our journey began more than 10 years ago with our mother company jabeKONSULT AB as a mission with renewable energy on the Shetland Islands, trying to tame the tidal currents and demonstrate the technology. When we released the difference between tidal streams and running water we decided in a firsts step to focused on the tests in rivers and creaks for remote areas and as a humanitarian aid. Since 2012 we overtook together with our mother company patent and up to now the project is self-financed. As a co-mission from the Ankarfundation (note) a NGO in Sweden who the last 20 year built more than 200 schools in the Colombia, PERU and Brazil Amazonas area. we been asked about the possible to adopt this technic for gaining electricity from Amazons river. Comparing the Amazon river water flow 1-3 m3/sek and more than 200 000 m3/s. with a Swedish river (Göta-älv) with a running speed of 0,8-1,2 m/s and a normal water flow of 500 m3/s. jSP(TM) prototypes been tested in more than 10 rivers/creeks in Sweden with a very positive result..
jSP(TM) have proved to produce more than 10 MWh/year, depending on the circumstances. Powering Amazonas river Colombia,Peru and Brazil. jSP(TM) have during 6 years together, with Swedish collages in place, tested the possibilities of Amazons Rivers. and the last 2 years we have a DEMO unit in place for validations of the technic. jSP(TM) units and taking part in the Colombia national funded project. Increase the living condition in the State of Amazonas to electrify more than 200 remote (OFF-GRID) schools and villages. Powering Africa: In the joint venture with USA/Swedish Ministry of Foreign Affairs with the goal to electrify Africa within 20 years, we are a member of “Team Sweden energy for Africa”. We will use the experience from Colombia as a start in Rwanda /Uganda where the Government have a national plane for implementation and payment. Today the management team consist of 8 people with adequate skills.